Our client: A Food Manufacturing/ Trading SME is seeking qualified candidates to join their growing logistics team! • Notify partners of shipping schedule and send shipping documents by courier to partners. • Maintain inventory records and perform monthly reconciliation. • Prepare monthly inventory replenishment proposal for Singapore distributor. 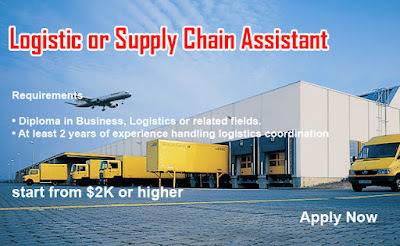 • Diploma in Business, Logistics or related fields. Interested applicants may apply by sending in your updated résumé (in MS Word format) to Lim Hui Leng (EA Personnel Registration No: R1769237) at blessing6@achievegroup.asia Or contact me 86880813 (Serene Lim)for a confidential discussion We regret to inform that only shortlisted candidates will be notified. 0 Response to "Logistic or Supply Chain Assistant / West/ $2K or higher"